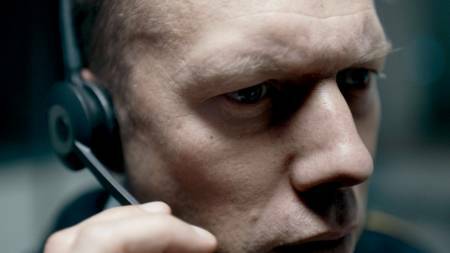 Tense, absorbing Danish police emergency call drama marks a "crackerjack feature debut"
The Guilty was reported on earlier in Filmleaf's 2018 Sundance thread: you can read Mike D'Angelo's Letterboxd review that says Möller does "a solid if unremarkable job of sustaining visual interest while confined to a single bland location, and generates considerable suspense from noises heard tinnily through the protagonist's earpiece." They aren't heard all that tinnily, though: the auxiliary soundtrack is as full throated as it needs to be to enrich the mainly one-person drama. An accomplished, spare tour-de-force, all the action concerning a crisis confined to a police office call station and one man, a demoted officer struggling to save a woman being abducted by her ex-husband. D'Angelo confesses to finding aspects of the story implausible, and going back and forth on the film but with a positive conclusion overall: "Thought Möller had won me back over at the end, but then he adds a cheap additional misdirection (for which I did not fall), and I got annoyed at the contrivance again. Crackerjack feature debut, though." It has been bought by Magnolia, and it got the Sundance World Cinema Audience Award. Also reviewed in Variety, Hollywood Reporter, The Village Voice, The Verge, and other publications. This film invites comparison with Tom Hardy in Stephen Knight's 2013 Locke as a telephone tour-de-force. Anything like this is like a radio play, not at all a bad association: radio plays used to be wonderful and they stimulate the imagination more than TV or movies. Actually Locke is in some ways more limited and others richer. Both are excellent dramas. While The Guilty plunges us in the effort of phone emergencies duty cop Asgar (Jakob Cedergren) to save a woman who has been abducted by her ex-husband in his van, Locke, while suspenseful too - that's the nature of the genre - is more a character study from the start. Tom Hardy's protagonist is a wrongdoer, like Asgar, the cop suspended from street duty with his partner Rashid (Omar Shargawi) pending a court hearing tomorrow. And tomorrow is initiation of the biggest project of architect Locke's career, which involves laying foundations for large buildings, and it has to be run by his assistant because he must go to a London hospital for the birth of his child - to a woman not his wife. He's expected at home tonight to be with his family to watch an important football match, and he won't be theither. His effort to juggle all these things and keep them from tumbling down on him is the nail-biter. In the juggling of multiple valences the Hardy vehicle - which one can't imagine working without him - resembles the stage play Michael Shannon did in 2011 about the failing theatrical agent, Mistakes Were Made. All these works are a matter of juggling multiple strands around a single main speaker on the phone (or phones) in front of us and keeping our attention riveted. They are all portraits of the man. Asgar becomes desperate to save Iben (Jessica Dinnage), the abducted wife, from Michael (Johan Olsen) but doesn't know the location of his van, only the district (New Zealand, Copenhagen). And that's not all he doesn't know. In this respect, The Guilty is more single minded, simple, and focused on a single set of events than the other two stories. It also seems, somehow, more "real." When watching Shannon and the arguably even more gifted Hardy I was constantly repeating to myself, "Wow, isn't this guy talented!" WithThe Guilty, I was not. This is a tribute to the scenario as well as to Jakob Cedergren's acting, which allows him to disappear into the part of Asgar, to keep it from feeling like an aria. Guilty/Der Skyldige, 85 mins., debuted Jan. 2018 at Sundance; it was also sown at Rotterdam, Göteberg and Sun Valley, and it was screened for this review as part of the MoMA-Film Society of Lincoln Center series New Directors/New Films Mar. 2018. This is Möller's first feature; in 2015 he made a 28-min. short film about a woman seeking to leave a closed psychiatric ward.